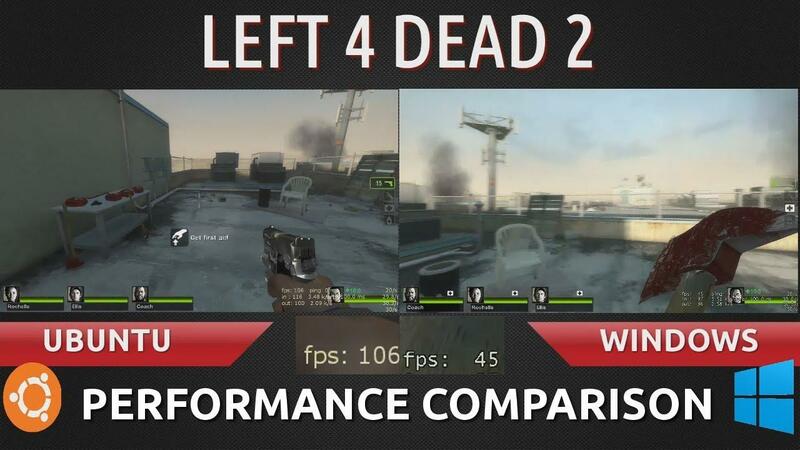 How Does Left 4 Dead 2 Perform On Ubuntu 13.04 Compared To Windows 8? Hey there folks! Today I bring you a smaller but new test I did recently with my system. Needless to say, I was actually shocked when watching the videos and seeing the difference myself. This reassures me that Native gaming is a must over Wine gaming (although this is just my opinion). Some may point out that Fraps is too heavy of a screen recorder to get an accurate reading of fps, however I tried other alternatives available to me such as XFire and MSI Afterburner and Fraps hands down is the only one giving Windows a fighting chance. [More info on this in the description of the video page]. Remember, that Windows is usually heralded as having better support and drivers compared to Linux in general. Taking this into consideration, both OS's were put under the duress of running L4D2 at maxed out settings while simultaneously performing the screen recording as well. I ran the Windows test multiple times to ensure similar results, and I ran the Ubuntu test twice with the same results. Please pause the video at 0:08 to view the settings at which I played L4D2 (the settings are same across both OSs). I am only human, so it is very likely there were mistakes or things I may have overlooked. Please feel free to correct me, offer me guidance or even post your own results! The more tests we have, the greater the sample we can make judgement from. A thank you to the kind folks who guided me on ways to better my future test videos based on my older videos, I hope to do a few more of these if people enjoy watching them. Please note that the experience may be completely different for AMD graphics users and Intel graphics users. I do not claim that this will be what everyone experiences whether now, in the past or in the future. It is just what I have so far consistently experienced. The only thing: When I (and it appears in the video I think) start l4d2 on that mission the entire time the helicopter is above it's very choppy. It happens in windows, but only slightly compared to Linux. It's also weird that the FPS are higher in Linux when that happens. So it seems FPS isn't everything in the Linux performance equation. That good but i afraid it the other way for ATI users like me. I actually get higher FPS in Windows than on Linux. I know it not just me because my friends who also uses ATI have higher FPS in windows than on Linux. Oh well what do I expect from crap ATI linux drivers. n30p1r4t3 The only thing: When I (and it appears in the video I think) start l4d2 on that mission the entire time the helicopter is above it's very choppy. It happens in windows, but only slightly compared to Linux. Both videos are choppy despite fps being way over 24. I believe that the screen recording tool makes everything choppy. owen123 That good but i afraid it the other way for ATI users like me. I actually get higher FPS in Windows than on Linux. I know it not just me because my friends who also uses ATI have higher FPS in windows than on Linux. Quote That good but i afraid it the other way for ATI users like me. Sadly, I know what you're going through. I previously used an HD4850 then a HD6850, and the AMD drivers in Linux just kept getting worse. After having used AMD graphics for so long in my family, I then jumped to Nvidia sometime in January I think. The drivers really are better on the Nvidia side so far. Quote Both videos are choppy despite fps being way over 24. This is because V-Sync is disabled. I did this on purpose, so we can see the fps fluctuate outside of 60Hz (my screen's maximum fps threshold). My eyes in real life cannot see the extra frames above 60, but the screen recorder can. So it picks up the major spikes in the frames per-second in both tests. On the windows side it looks choppy because it is less than 60 fps. On the Ubuntu side, it looks choppy because the frames jump from a 50-60 to a 100+ threshold so the changes are frequent and large. My screen recording can only be smooth if I record with V-sync enabled, as that forces the game to stay within 60 fps and reduce screen tearing or loss of frames. I've not actually played L4D, or L4D2, and nor down I own either, so please take these comments with that in mind. I'm assuming that the windows version was D3D based, where as the Linux would (obviously) be OpenGL. There's a good deal of difference right there, and I suspect Valve may have reworked various areas to better suit OpenGL rendering styles more than D3D, and that's before things like driver optimisations come into play. None of which matters to end user too much, who would only care about how much performance they can squeeze out of their systems. It would, however, be interesting to know how much performance tweaking was really required for the Linux version (and, by extension, OpenGL support) vs Mac vs Windows. It then makes me wonder how much more (graphically speaking) could really be achieved by the same hardware if developers put in that little more effort to their game engines, level design, etc etc etc. Also, I've not had any AMD driver issues in a very long time, and stuck with them because I had more issues with nvidia blobs at the time. I'm quite sure the nvidia drivers are much better by now, and I know the AMD proprietary ones are (I don't use the open source drivers...yet). It'd be cool if someone could compare how the open source drivers are coming along with this game. Last note: reminded of r200 Linux drivers with UT long ago. Now that was a sight to behold and play with. Quote It'd be cool if someone could compare how the open source drivers are coming along with this game. I would like to see a comparison of this too! mirv There's a good deal of difference right there, and I suspect Valve may have reworked various areas to better suit OpenGL rendering styles more than D3D, and that's before things like driver optimisations come into play. Based on that, you would naturally suspect that any graphics card API conversion issues to be on the Linux side of things, not Windows! I can give some info on how the open source AMD drivers are doing with this game. I have an AMD HD5670 running LFD2 on Medium settings (it's not a powerful card) with Mesa 9.2 in Mint 15 and I get fairly smooth game play. I never use the proprietary AMD drivers as they usually give me problems with certain games and only offer slightly better performance...for now. With AMD releasing open source code for UVD and dynamic power management I really wouldn't recommend the proprietary AMD drivers going forward. Also, the open drivers have played pretty much every game (Killing Floor, Mark of the Ninja, TF2, LFD2, Awesomenauts) I have thrown at them without any problems with the exception of Oil Rush which requires OpenGL 3.2 (open drivers are at OpenGL 3.1 at the moment). Quote from mirv There's a good deal of difference right there, and I suspect Valve may have reworked various areas to better suit OpenGL rendering styles more than D3D, and that's before things like driver optimisations come into play. Yes, I remember that now. I always wondered if it was Valve's way of just saying "our rendering api can switch between d3d and opengl backends", which is quite common, or if they really have a d3d "implementation" in opengl. I suspect the former, and that their rendering api was very similar to d3d by virtue of it being the only one supported at the time. Could be mistaken there of course. Either way, I do wonder if they did anything to the "higher level" rendering pipeline to accomodate changes.